54 INSIGHT VACATIONS | USA & CANADA AIRFARE & PEACE OF MIND With you all the way GENERAL CONDITIONS: Discounts and savings only apply to the land portion of your vacation, may not be available on all trips and departures, and are not applicable with extra nights' accommodations, optional extensions, airfares, taxes and fees, flight supplements, surcharges and airport transfers. EARLY PAYMENT DISCOUNT: Only applies to the land portion of selected trips featuring the Early Payment Discount in the trip planner. See itinerary pages. Can be combined with other discounts. Pay your deposit when booking and the balance by the date shown on page 55. Offer is subject to availability and may be withdrawn at any time without notice. Please see Booking Conditions on pages 52-53 for details. 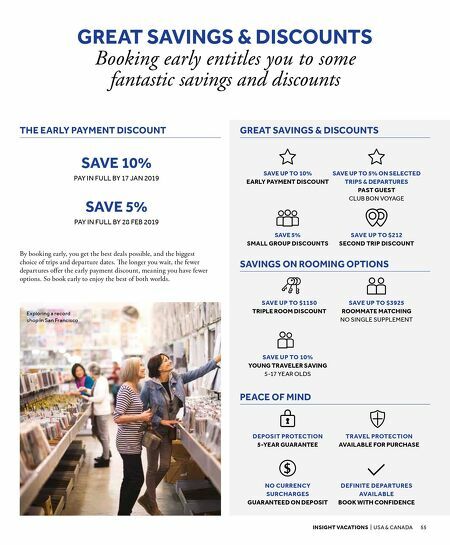 PAST GUEST DISCOUNT: If you are a repeat Insight traveler, or a previous guest of any TTC company, you can unlock special offers such as up to 5% off select trips and departures with us or our sister companies. Redeeming this discount is limited to one trip per calendar year (you must book after your initial trip is completed) and will be applied to an eligible, higher priced trip, if you book two trips at once. Can be combined with other discounts. Visit TTC.com/loyalty for details. YOUNG TRAVELER DISCOUNT: Must be aged 5-17 at time of travel and accompanied by at least one adult sharing a room. Discounts are limited to up to two young travelers per room. Discounts can often be applied to included cruise aspects of trips – see full itineraries. Can be combined with other discounts. SECOND TRIP DISCOUNT: Book two Insight trips of seven days or more and save on the lowest priced trip. Take three trips and save on two. All trips must be booked at the same time and on the same booking number to qualify. Savings may vary by trip – see individual trip planner box on relevant trip page for details. Does not apply to Egypt, Israel or Jordan trips or trips with trains, cruises or cruise extensions. Can be combined with other discounts. TRIPLE ROOMS: Triple rooms are based on three people sharing one room with existing bedding arrangements (usually two beds), they do not include the cost of any additional bed or 'roll away'. Triple rooms are limited on cruises and not available on all trips. See trip planner box on the individual trip page for details. Can be combined with other discounts. ROOMMATE MATCHING: If traveling alone, we will match you with someone of the same gender, so you don't have to pay the single room supplement. Shared rooming will be accommodated in non-smoking twin rooms and is not applicable on trips to Alaska or trips with cruises. SMALL GROUP DISCOUNTS: Available when 5 or more guests are booked together at the same time and on the same booking. Combinable with other discounts, except Milestone Celebrations Discount. MILESTONE CELEBRATIONS: Speak to a member of our team at the time of booking if you are traveling as a group of 5 or more and celebrating a special occasion with family and friends. We can offer 5% off everyone in the group's trip as well as throwing in a cake, a card and a bottle of sparkling wine. Not combinable with other group discounts. DEPOSIT PROTECTION: If you must cancel your trip, you can keep your deposit as a credit for five years. Travel credits can only be redeemed once per person and a limit of one trip credit applies per booking. Does not apply if you previously received a full refund. We reserve the right to validate past booking status. Visit insightvacations.com/savings for details or call your travel agent. PRICED AT: trips up to $2,000: $149 PER PERSON PRICED AT: trips $2,001 to $3,500: $219 PER PERSON PRICED AT: trips $3,501 to $5,000: $279 PER PERSON PRICED AT: trips $5,001 to $7,500: $339 PER PERSON PRICED AT: trips $7,501 +: $399 per person (payable with your deposit only) and includes: Note: Prices are subject to change without notice. SECTION I: TRIP Cancellation WAIVER Provided by Insight Vacations* e Trip Cancellation Waiver offers guests the opportunity to receive a refund from Insight for the otherwise non-refundable trip costs prepaid to Insight if you need to cancel due to illness, injury, death, subpoena, jury duty, job transfer and more. For New York residents, Trip Cancellation benefits are underwritten by Transamerica Casualty Insurance Company, Columbus, Ohio; NAIC #10952 under Policy/Certificate Form series TAHC5000. Insight "Any Reason" Cancellation Waiver If you purchase Travel Protection within 14 days of deposit, the Insight "Any Reason" Cancellation Waiver allows you to cancel your trip 24 hours or more before your scheduled departure for any reason that is not eligible under the Trip Cancellation Waiver provisions. When a Cancellation that is not eligible under the Trip Cancellation Waiver provisions occurs during a penalty period, your Cancellation penalty will be refunded in Insight Travel Certificates, with the balance of the refund made either in cash or by credit card credit. Notice to New York residents: e "Any Reason" Cancellation Waiver may be purchased separately from the Travel Insurance Benefits. Contact 1-888-722-2195 for details. SECTION II: TRAVEL INSURANCE BENEFITS Underwritten by Transamerica Casualty Insurance Company** Trip Interruption: Up to Total Trip Cost Trip Delay: Up to $1,000 ($150/day) Baggage Protection: Up to $2,500 Baggage Delay: Up to $500 Medical Expense: Up to $50,000 Emergency Evacuation/Repatriation: Up to $100,000 SECTION III: WORLDWIDE EMERGENCY ASSISTANCE Ser vices provided by On Call International. CareFree™ Travel Assistance, Medical Assistance, Emergency Ser vices – ser vices available 24/7 is plan provides insurance coverage that applies only during the covered trip. You may have coverage from other sources that provides you with similar benefits but may be subject to different restrictions depending upon your other coverages. You may wish to compare the terms of this policy with your existing life, health, home and automobile policies. If you have any questions about your current coverage, call your insurer, insurance agent or broker. e above information is a summary – a plan description detailing the terms, conditions and exclusions will be sent to you – we have highlighted just a few of the plan benefits. If you have any Travel Protection questions, please call our plan administrator at 1-866-808-7161. 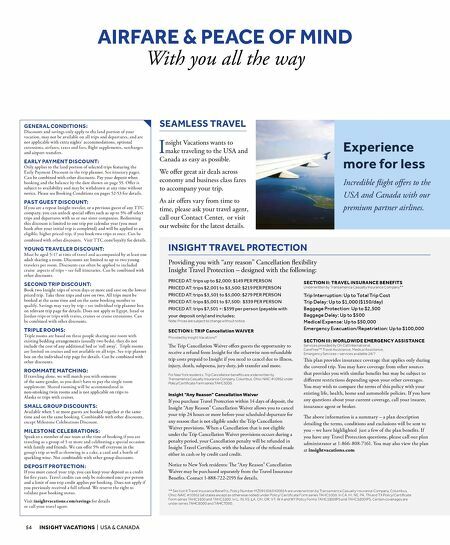 You may also view the plan at insightvacations.com INSIGHT TRAVEL PROTECTION Providing you with "any reason" Cancellation flexibility Insight Travel Protection – designed with the following: I nsight Vacations wants to make traveling to the USA and Canada as easy as possible. We offer great air deals across economy and business class fares to accompany your trip. As air offers vary from time to time, please ask your travel agent, call our Contact Center, or visit our website for the latest details. SEAMLESS TRAVEL Experience more for less Incredible flight offers to the USA and Canada with our premium partner airlines. ** Section II Travel Insurance Benefits, Policy Number MZ0911062H0002A are underwritten by Transamerica Casualty Insurance Company, Columbus, Ohio: NAIC #10952 (all states except as otherwise noted) under Policy/ Certificate Form series TAHC5000. In CA , HI, NE, PA , TN and TX Policy/Certificate Form series TAHC5100 and TAHC5200. In IL, IN, KS, L A , OH, OR, V T, W A and W Y Policy Forms TAHC5100IPS and TAHC5200IPS. Certain coverages are under series TAHC6000 and TAHC7000.